Scientists in Lyon, a French city famed for its cuisine, have discovered a quick-cook recipe for copious volumes of hydrogen (H2). The breakthrough suggests a better way of producing the hydrogen that propels rockets and energizes battery-like fuel cells. In a few decades, it could even help the world meet key energy needs—without carbon emissions contributing to the greenhouse effect and climate change. The DCO is a global, 10-year international science collaboration unraveling the mysteries of Earth's inner workings—deep life, energy, chemistry, and fluid movements. 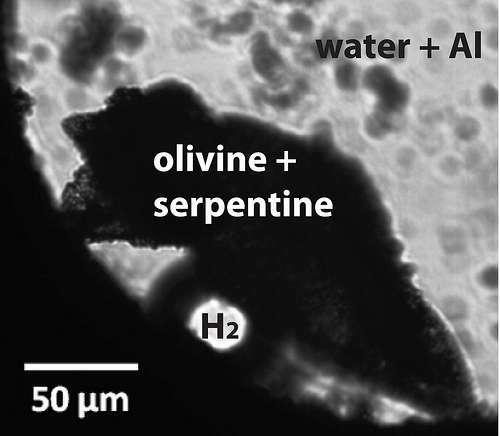 In a microscopic high-pressure cooker called a diamond anvil cell (within a tiny space about as wide as a pencil lead), combine ingredients: aluminum oxide, water, and the mineral olivine. 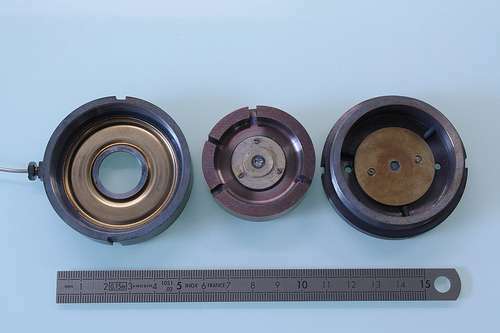 Set at 200 to 300 degrees Celsius and 2 kilobars pressure—comparable to conditions found at twice the depth of the deepest ocean. Cook for 24 hours. And voilà. Dr. Daniel, a DCO leader, explains that scientists have long known nature's way of producing hydrogen. 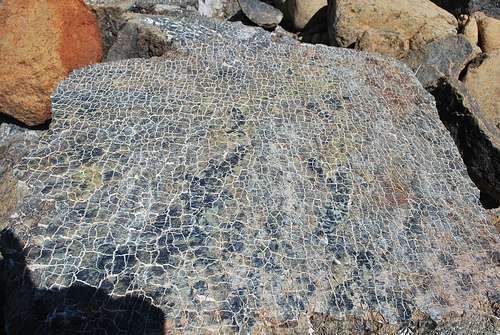 When water meets the ubiquitous mineral olivine under pressure, the rock reacts with oxygen (O) atoms from the H2O, transforming olivine into another mineral, serpentine—characterized by a scaly, green-brown surface appearance like snake skin. Olivine is a common yellow to yellow-green mineral made of magnesium, iron, silicon, and oxygen. Jesse Ausubel, of The Rockefeller University and a founder of the DCO program, says current methods for commercial hydrogen production for fuel cells or to power rockets "usually involve the conversion of methane (CH4), a process that produces the greenhouse gas carbon dioxide (CO2) as a byproduct. Alternatively, we can split water molecules at temperatures of 850 degrees Celsius or more—and thus need lots of energy and extra careful engineering." At the time of the AGU Fall Meetings, Dr. Andreani will be taking a lead role with Javier Escartin of the Centre National de la Recherche Scientifique in a 40-member international scientific exploration of fault lines along the Mid-Atlantic Ridge. It is a place where the African and American continents continue to separate at an annual rate of about 20 mm (1.5 inches) and rock is forced up from the mantle only 4 to 6 km (2.5 to 3.7 miles) below the thin ocean floor crust. The study will advance several DCO goals, including the mapping of world regions where deep life-supporting H2 is released through serpentinization. Aboard the French vessel Pourquoi Pas?, using a deep sea robot from the French Research Institute for Exploitation of the Sea (IFREMER), and a deep-sea vehicle from Germany's Leibniz Institute of Marine Sciences (GEOMAR), the team includes researchers from France, Germany, USA, Wales, Spain, Norway and Greece. Indeed, DCO scientists hypothesize that hydrogen was what fed the earliest life on primordial planet Earth—first life's first food. And, she adds: "We believe the serpentinization process may be underway on many planetary bodies—notably Mars. The reaction may take one day or one million years but it will occur whenever and wherever there is some water present to react with olivine—one of the most abundant minerals in the solar system." At AGU, they will report the results of deep sampling from opposite sides of the world, revealing enigmatic evidence of a deep subterranean microbe network. "Two years ago we had a scant idea about what microbes are present in subsurface rocks or what they eat," says Dr. Schrenk. "Since then a number of studies have vastly expanded that database. We're getting this emerging picture not only of what sort of organisms are found in these systems but some consistency between sites globally—we're seeing the same types of organisms everywhere we look." In deep Earth, despite extreme high temperatures and pressures, water is a fluid that circulates and reacts chemically with the rocks through which it passes, changing the minerals in them and undergoing alteration itself—a key agent for transporting carbon and other chemical elements. Understanding what water is like and how it behaves in Earth's deep interior is fundamental to understanding the deep carbon cycle, deep life, and deep energy. This water-rock interaction produces valuable ore deposits, creates the chemicals on which deep life and deep energy depend, influences the generation of magma that erupts from volcanoes—even the occurrence of earthquakes. Humanity gets glimpses of this water in hot springs. There are easier ways, among them nuclear fission, and the application of either heat or electricity. There are ways to make H2. Scaled correctly and with Congress (governments) acting to muzzle the Watermelons, H2 can be made quite cheaply. Storage and transport are the be-otch. Get to the point and tidy it up - a lot.